"Mom! Mom!! Can you help me put on my boots?" "I'm going to go play out in the sand with my cars." This sounds like a conversation I might have with my son. But you'd be wrong. This is the conversation I had with my 5 year old daughter. She loves to play with cars, dinosaurs and play superheroes. Don't get me wrong, she also loves to wear purple and pink, decorate her room with mermaids and sing at the top of her lungs. But none of those things define her. She is her own person and whether she likes "boy toys" or "girl toys" doesn't matter. What matters is that she is playing. Because when children play, they learn about the world. Play is not gender specific!! That is why I was so excited about Walmart carrying PLAYMOBIL products. In fact, my local Walmart has so many great PLAYMOBIL options that it was really hard to choose just one. So naturally, I bought one and than a couple of the fun smaller products like all the cute animals to go with it. The selection was great too!! And so were the prices. If you are unfamiliar with PLAYMOBIL and their products, let me share. PLAYMOBIL creates really fun play sets that focus on iconic figures in a variety of worlds, both real and imaginary. These are such fun play sets that children can build and explore. PLAYMOBIL has everything from community landmarks like the police station or school bus, to the land of dinosaurs and pirates. 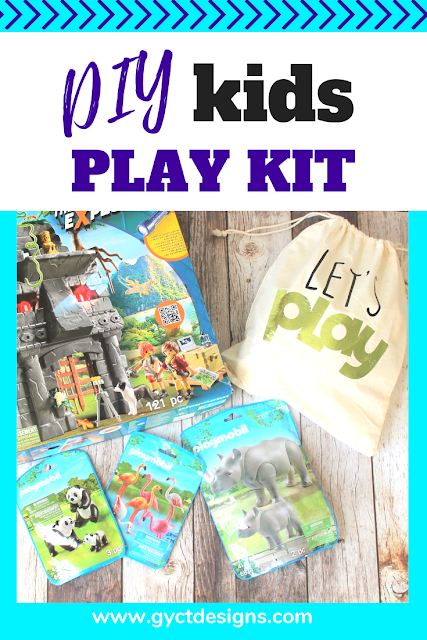 Each set can be combined and played with using a child's unique play style and imagination. Which for my daughter means the pink flamingos get to hang out with the T-rex. I'm actually most excited about these play sets because winter is upon us. That means cold temperatures and snow. Yes, we go out and play in the snow, but more often than not it is too cold and wet. Now, my children can pull out their new PLAYMOBIL Hidden Temple with T-Rex set. Add a few fun Pink Flamingos, Pandas and some Rhinos and they have the perfect hidden "wilderness" to explore and discover. And since my children have to work together and play together these PLAYMOBIL play sets help them to develop both cognitive and social skills. Learning to share with a brother, sister or friend. Working to follow instructions to build their PLAYMOBIL world and learning to ask for help. All important skills for children (and adults) to learn. And they are doing this all while playing!!! To help keep the excitement alive for my daughter and son, I like to put together fun areas in the house to set up their toys. Like moving couch cushions to make houses or draping blankets to make a fort. I want their imagination to run wild. Today I want to share with you a super quick way to make a hidden wilderness for the PLAYMOBIL Hidden Temple with T-Rex. Perfect for both little girl and little boy explorers. First, what is a play kit? It would be a kit that includes everything a child needs to create a particular project. Just grab a drawstring bag and fill it with all the tools they would need for a particular craft, activity or in this instance a play area set up. You can keep all your play kits and store them, or just use the same bag each time and give the child a new activity. Any way you do it, just let them be creative! Lay out the green blanket flat on the ground in a large enough area that you can add chairs. Add to chairs (can be folding or not) to either edge of the blanket area. Make sure they are facing backwards from each other. Drape a blanket over the 2 chairs to make a hidden cave or fort. Drape the blue towel down one side of the chairs. This will be the "waterfall". Drape the pillowcase over the bottom bar on the chair to make a small "tent" for the explorers that come with the PLAYMOBIL Hidden Temple with T-Rex. Set up your PLAYMOBIL Hidden Temple with T-Rex and all your fun PLAYMOBIL animals. Take time to set up the tent for the explorers. They need room to set up all their equipment like the laptop, microscope and lights. Set up your animals on the bottom of the waterfall or at the top traveling towards the water. Not only does PLAYMOBIL ignite a child's imagination, but each set is high-quality and has so many fun and unique details. You might be surprised at all the little details you will find while you build and play. Like these adorable little creatures and the fun jewels and backpacks for each of the explorers. It is the small details that my daughter especially loves. These help her to be more creative in her playing. When I have time, I like to set up these fun play areas before my children come home from school or from playing outside. Than when they walk in the door or into their room they have a fun surprise waiting and they enjoy hours of playtime together. 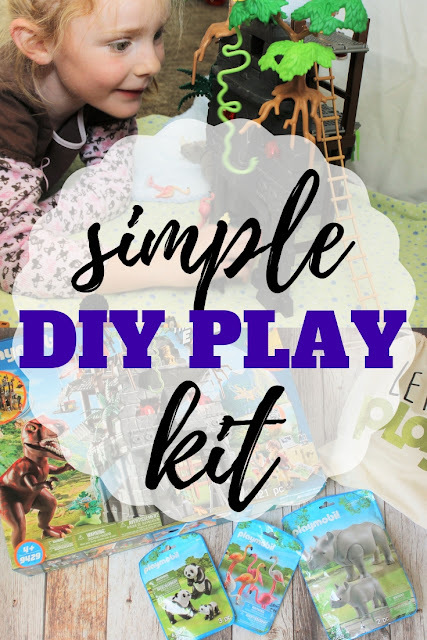 These DIY kids play kits are super simple but can lead to hours of play for a child. 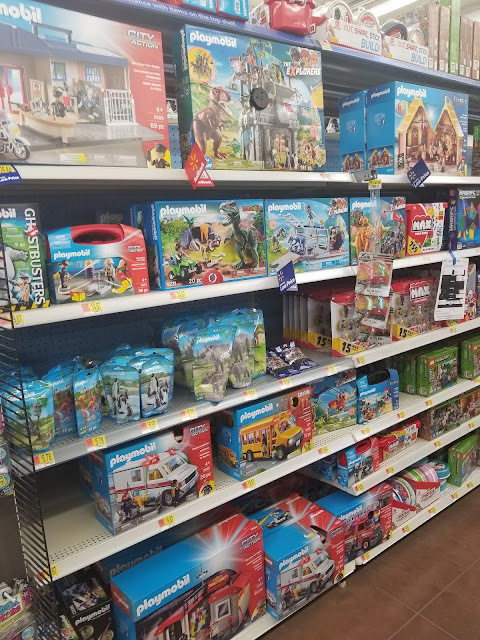 Don't forget to check Walmart for all the great PLAYMOBIL products to help your child's imagination start growing today!